Narkobyz is a name of the biggest shaman Kobyz. By right it is regarded as one of the most ancient stringed musical instruments in the world. 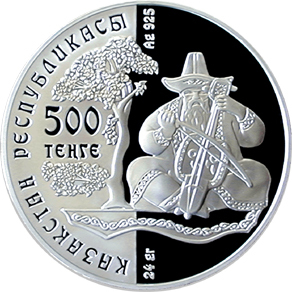 In the left part of the right side of the coin on the mat surface a figure “500” with a legend “TENGE” indicates face value of the coin. Along the circumference there is a legend “Republic of Kazakhstan”. 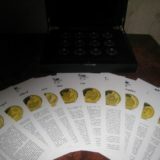 Letters of the legends and figures are pressed. 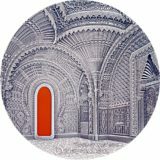 The right part of the polished surface represents an old man playing Kobyz and sitting on a rug under the canopy of an exotic tree. 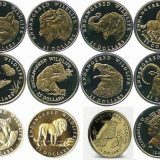 In the top and bottom parts of the coin, legends “Ag 925” and “24 gr.” are shown correspondingly, revolved by 90 degrees and designating the production metal of the coin is made of, its standard and weight. 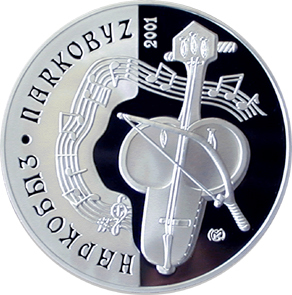 The polished surface of the right part of the back side of the coin shows a representation of Narkobyz, Kazakh national musical instrument. In the middle part there is conventionalized image of a music stand with a fragment of the written down melody of a song “Karlygash” by the composer Akhmet Zhubanov. 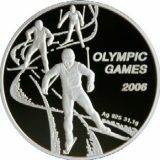 Along the circumference in the left part of the coin on the frost surface there are legends “NARKOBYZ”. Letters of the legend are pressed. 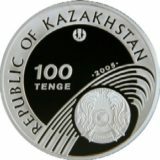 In the top part a figure “2001”, revolved by 90 degrees indicates the year of coinage, in the bottom part there is a trademark of Kazakhstan Mint.